It’s easy to see why food challenges are here to stay: restaurants enjoy the spectacle of customers eating mega-portions of their food; ambitious diners relish winning attention and maybe a T-shirt for clearing their plates. But, real talk: you’ve got to be out of your mind, very hungry, or both to take on these food challenges. Some are heat level-based, some are volume-based, but all are for the taking. 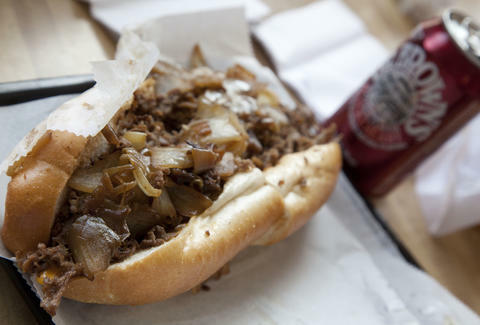 Pick your poison and ready your fork because here are the biggest food challenges around Philly. How many cheesesteaks can you shove into your face in an hour? Current record-holder Bob “The Notorious BOB” Shoudt managed to put away 20 sandwiches in the time it takes to watch one House of Cards episode. That’s a lot of bread, meat, and cheese, people. Take on his record, if you dare. As far as food challenges go, this one is fairly straightforward. There’s not a crazy combination of food, there’s just a lot of it. Gobble down a large cheesesteak, a 3lb tray of fries, and a large soft drink in 30 minutes or less, and a Pudge's T-shirt is yours. Prize: Free food, a T-shirt, your name engraved on a plaque on the wall, and a bottle of Joe’s Hot Sauce. ... And, if you complete this challenge at all three Drinker’s locations, you get free drinks for a year. Slam 33 of the $1 chicken or beef tacos in 13 minutes and glory will be yours. 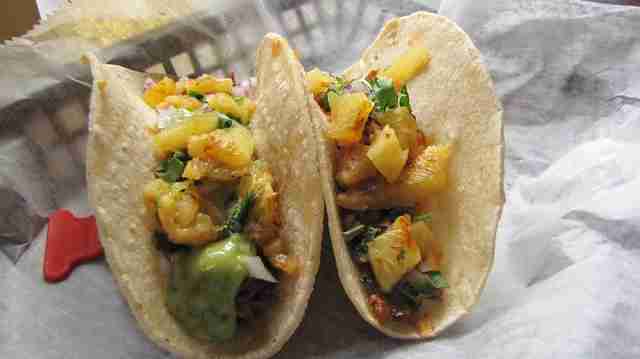 Sure, these street-style tacos are small -- about two bites each -- but they add up. Twenty tacos is roughly 4lbs of food. Note that even if you win, you still have to pay for the tacos you ate. Your waistband better be made of elastic to tackle this behemoth. Not only do you have to eat this Frankenstein of a sandwich brimming with all kinds of deli meat and sandwich toppings -- corned beef, pastrami, turkey, roast beef, and brisket with coleslaw, Russian dressing, Swiss cheese, lettuce, tomato, and onion, to be exact -- but you also have to eat an order of potato salad, coleslaw, and one of each kind of pickle Kibitz makes. Beware: if you can’t finish it, there’s a $50 charge. 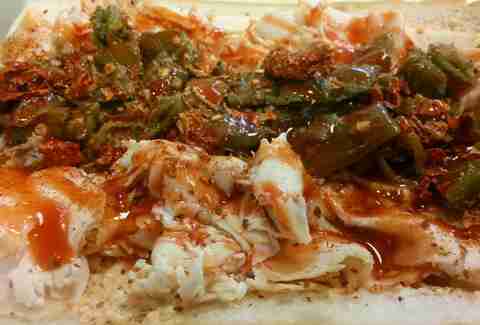 You don’t have to unhinge your jaw to chomp on this bad boy, but man, it would it help. 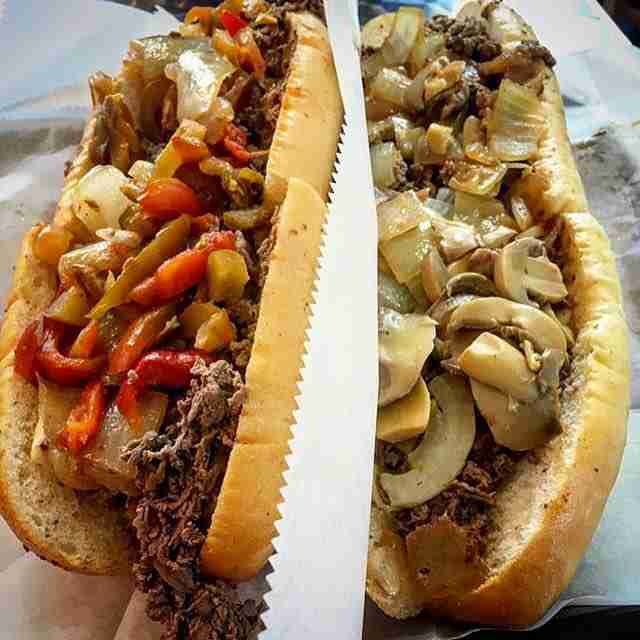 Right in the heart of South Philly’s Cheesesteak Vegas is a truly impressive food challenge. 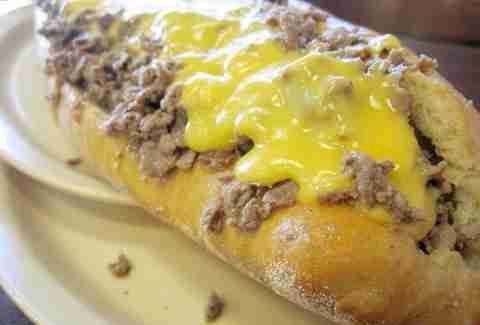 This massive cheesesteak contains more than 6lbs of meat and various cheeses with mushrooms and onions. It’s like eating Thor’s forearm. 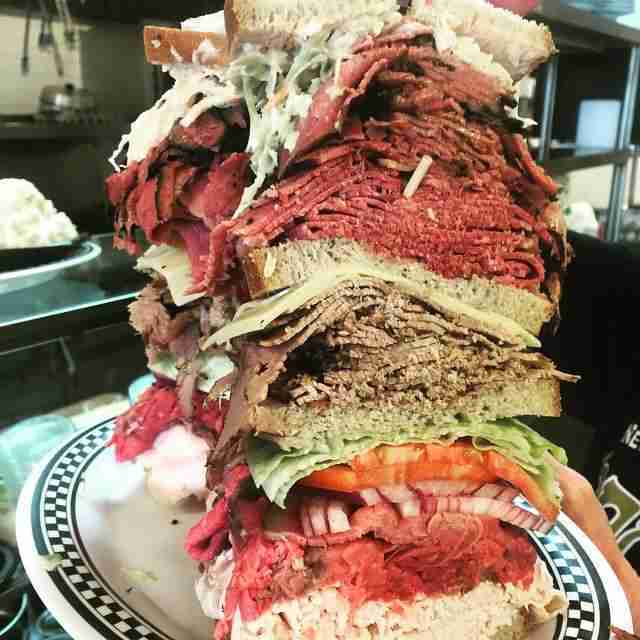 With two days advance notice, you and up to two of your buddies can take on this monster. It’s a 4lb Montreal-style everything bagel with three pounds of Coney Island smoked salmon, two pounds of Spread’s whitefish salad, and two pounds of farm cheese with (un)healthy servings of tomatoes, onions, and capers piled on top. 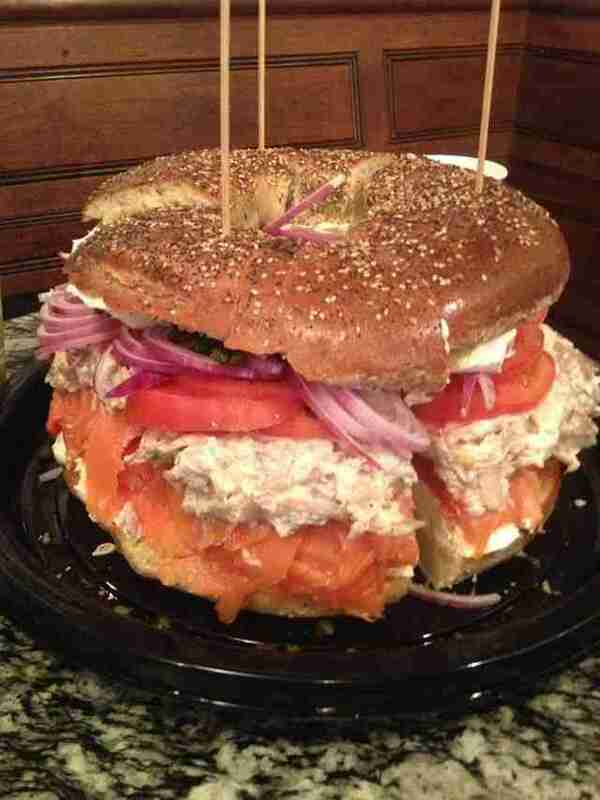 This is basically what Godzilla would eat if it came to brunch at your bubbe’s house. This is the most convoluted of all the food challenges we’ve seen. Three of the spiciest half-hoagies -- the Devil’s Flame, the Super Devil’s Flame, and The Non-Sense -- need to be consumed in order of least to most hot, along with a side of ghost pepper au jus. You can only drink water or soda during the challenge, no heat-tamping dairy. If you finish it all, the cash jackpot is yours. However, if you fail, you have to kick $50 into the kitty. Only those over 18 can participate -- you need to sign a waiver. 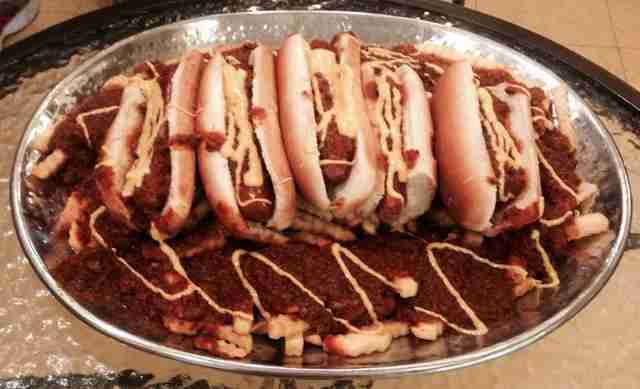 A pound of hot dogs, 2lbs of chili, and two pounds of fries splattered with Cheez Whiz round out this buckle-buster. It’s $20, but on the house if you lick the plate clean. Anna Goldfarb is author of the humor memoir, Clearly, I Didn’t Think This Through, and gets heartburn just thinking about doing any one of these food challenges. You can follow her: @MsAnnaGoldfarb.